This recent addition to the Inside the Apple archives is a wonderful look at Coney Island during its heyday. This postcard dates to 1906, the peak of the amusement park era. Just a decade earlier, most of the area was given over to restaurants, bath houses on the beach, and a few dance halls. There were a few rides--and the famous elephant, which burned down in 1896--but entertainment would not take over as Coney Island's main draw until the turn of the century. By the time this postcard was issued, most of Coney Island was given over to amusement parks, including the famous Steeplechase Park, Dreamland, and Luna Park (which is pictured inside the "N" of "Island" in the image above). What's most fascinating to us, however, are the three figures inside the "G" of "Greetings": Theodore Roosevelt, George Washington, and Abraham Lincoln. Was this to show that a trip to Coney Island--with its daring rides and scantily clad women--was still a morally upstanding place? Remember, T.R. was the sitting president at the time. It would be like going to Vegas today and having Barack Obama's face in the corner of your postcard of the Strip. You can see a great map of Coney Island in 1906 at http://www.westland.net/coneyisland/mapsdocs/coneymap06.htm. Click on any red dot on the map and it will bring up a vintage postcard or other image from the era. 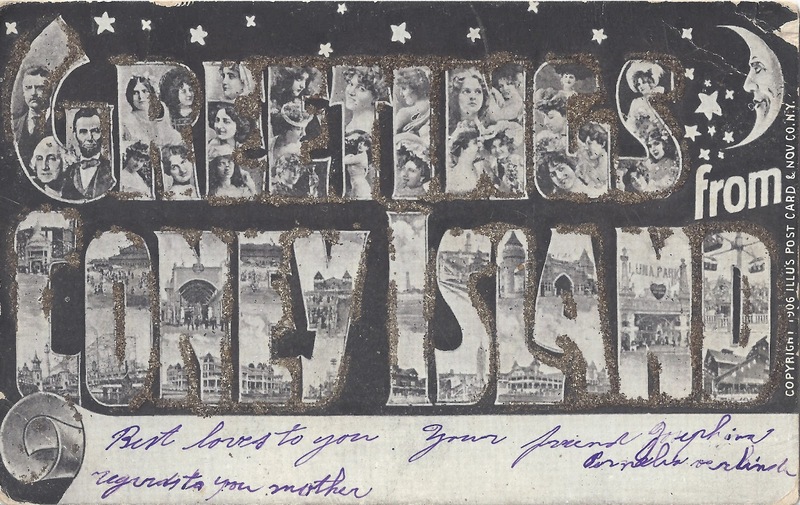 You can also read our earlier history of the postcard, and see a guidebook to saving money at Coney Island from the Brooklyn Historical Society here. Inside the Apple: A Streetwise History of New York City. To get RSS feeds from this blog, point your reader to this link. To subscribe via email, follow this link. Or, follow us on Twitter. Sixty years ago today, Julius and Ethel Rosenberg were executed as Soviet spies. Ethel was born on the Lower East Side in 1915, and Julius three years later in what was then Jewish East Harlem. Both attended Seward Park High School--which still stands at the corner of Essex and Grand streets--but there's no evidence they knew each other there. Julius and Ethel married in 1939, the same year Julius received a degree in electrical engineering from City College. The next year, he got a job with the Army Signal Corps. In 1942, he was recruited as a Soviet spy. Though many people protested Julius and Ethel's innocence at the time, it now seems clear that Julius was at least passing some secrets to the Soviet Union. Whether or not those secrets led to the USSR's accelerated development of atomic technology is a matter of much debate. One of their co-conspirators, Morton Sobell, claimed that the information Julius was passing to the Soviets was "junk," and that while Ethel knew what her husband was doing, she was not a spy herself. The Rosenbergs were executed just before sundown on June 19, 1953. The execution had originally been scheduled for eleven o'clock but in a last-ditch attempt for a stay, their attorney argued that this would violate the Jewish Sabbath. Instead of waiting, the federal government simply moved the execution earlier in the day. If you are a history-minded New Yorker, there's a good chance you'll enjoy Barry Rowell's new site-specific play "Manna-Hata," which takes place across the abandoned third and fourth floors of the Farley post office on Eighth Avenue. Only one hundred audience members are allowed at a performance, and the group is split into four sections, each with its own guide, including such diverse historical personages as Walt Whitman and Shirley Chisholm. The guides lead the audience through the post office and through time, from the Lenape creation story to the rebuilding of the World Trade Center--sort of a theatrical "Inside the Apple." 1. The show is advertised at three hours, but ends up being more like 3 hours and 15 minutes. You're on your feet almost all of that time. 2. The old post office is not exactly conducive to perfect acoustics. Some people reported having trouble hearing, other thought it was way too loud. 3. The first act is stronger than the second act, and the drama begins to lag in the 1950s. 4. Except for one scene, all audience members see the exact same thing, so it doesn't really matter which character is your guide. On June 13, 1927, New York honored aviator Charles Lindbergh with a tremendous ticker tape parade on Lower Broadway. As we've written in an earlier post, the Orteig Prize was sponsored by hotelier Raymond Orteig who owned the Lafayette and Brevoort Hotels in Manhattan. Orteig, hoping to boost Franco-American relations, first offered the prize to complete a transatlantic flight in 1919. When no one had made an attempt in five years, Orteig extended the competition and by 1926 it had begun drawing serious competitors. However, the hazards of aviation meant that by the time Lindbergh began his historic flight, six of his fellow competitors had died. Lindbergh's flight in the Spirit of St. Louis began on May 20 at 7:52 a.m. with his ground crew pushing the heavy plane down the muddy runway. The plane carried 450 gallons of fuel but Lindbergh had removed as much as possible from the plane, including his sextant--meaning that Lindbergh would have to fly by the stars (if they were visible) or dead reckoning. Lindbergh dodged bad weather across the Atlantic (sometimes flying as low as twelve feet above the waves) and reached Le Bourget at 10:22 p.m. on May 21st where he was mobbed by a crowd of eager well-wishers. On June 11, Lindbergh was presented with the Distinguished Flying Cross (the first ever); on June 13, New York honored him with the parade and a key to the city; on June 16, Orville Wright presented the aviator with the Orteig Prize at the Brevoort Hotel. Above, the newsreel cameras captured Lindbergh's flight and the hero's welcome upon his return. The ticker tape parade starts at about the three-minute mark. On Sunday, June 16, at 3:00pm, we will be returning to our favorite historically minded theater, the Metropolitan Playhouse, as special guests at a talkback following the matinee of Bronson Howard’s comedy The Henrietta. 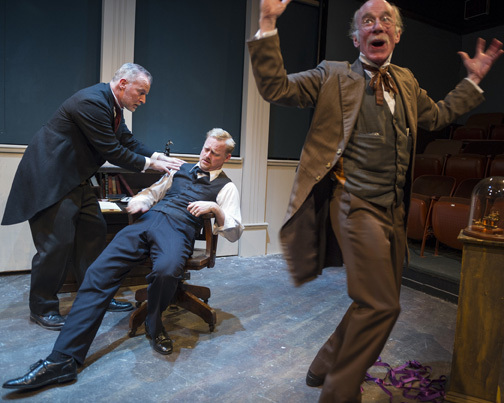 After the matinee performance on Sunday, June 16, we’ll be taking questions from the audience about the city as depicted in Howard’s play, as well as leading theater-goers on a “virtual” walk through 1887 New York. Among other things that happened that year: Nellie Bly went undercover in a madhouse, renowned minister Henry Ward Beecher died, and the Eldridge Street Synagogue opened on the Lower East Side. You can read more about the play at http://www.metropolitanplayhouse.org/essayhenrietta. Tickets can be purchased online at http://www.metropolitanplayhouse.org/tickets. We hope to see you there! The theater is located at 220 East 4th Street (between Avenues A and B); for directions visit http://metropolitanplayhouse.org/location. Don't Give Up the Ship! Today, June 4, is the two-hundredth anniversary of the death of James "Don't Give Up the Ship!" Lawrence, the commander of the USS Chesapeake in the War of 1812. Even if you've never heard of Lawrence, his dying command has filtered down to us as a great American saying. 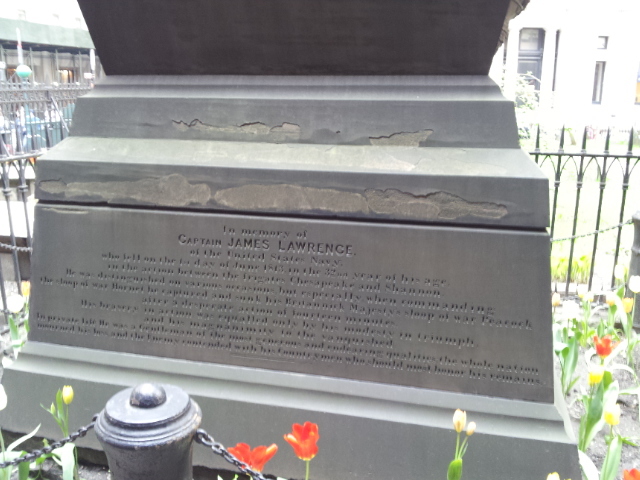 Lawrence is prominently buried at Trinity Church, Wall Street, near the southern entrance to the churchyard. Lawrence, born in New Jersey, joined the fledgling United States Navy in 1798, just in time for our two-year, undeclared war with France. He rose through the ranks quickly and in 1810 was put in command of the USS Hornet. When war broke out with Great Britain in 1812, the Hornet was used as blockade runner and helped squelch British privateering. In 1813, Lawrence was given command of the Chesapeake; on June 1, they left Boston and immediately ran afoul of a British blockade and the HMS Shannon. This was no surprise--the Shannon's captain, Philip Bowes Vere Broke, had personally challenged Lawrence to a fight. The Chesapeake was quickly overwhelmed; in the first fifteen minutes of fighting over 200 people were killed, and Lawrence lay fatally wounded. He ordered his men fight until the ship sank. "Don't give up the ship!" he exhorted. The wounded Chesapeake was no match for the British, however, and the Americans were soon captured and taken to Nova Scotia, where Lawrence died of his wounds three days later as his captured vessel was being towed to Halifax. After Commander Oliver Perry heard of his friend Lawrence's bravery, he had a battle ensign sewn with the words "Don't Give Up the Ship" emblazoned across it. Perry flew the flag during the Battle of Lake Erie, a major American victory. Perry's ensign now hangs at the Naval Academy Museum. Lawrence was buried in Halifax, then transferred to Massachusetts, and ultimately sent to Trinity. Lawrence's original marble grave marker now resides in the collection of the New-York Historical Society; the current, monumental grave marker, was erected after the Civil War. Footprints in New York: Tracing the Lives of Four Centuries of New Yorkers. 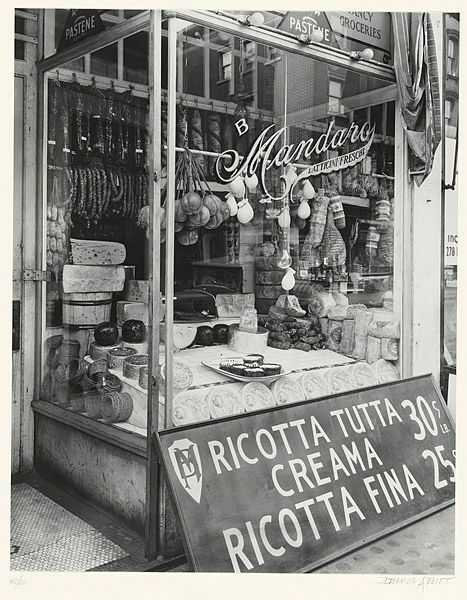 Check out our new book online at www.footprintsinnewyork.com. 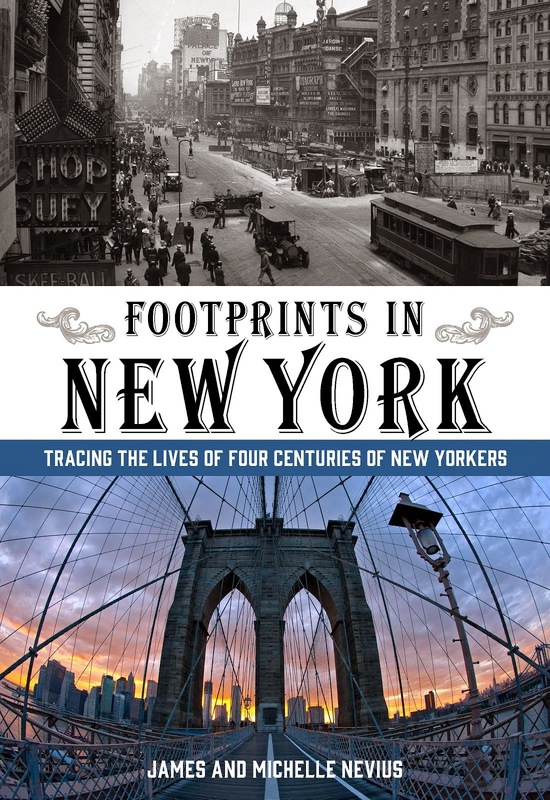 "Footprints in New York has some of the sharpest, most informative meditations on the history of the city that I have encountered in a long time." — Edwin G. Burrows, co-author of Gotham and author of Forgotten Patriots. Why Does a Ball Drop in Times Square on New Year's Eve?